The best way to learn is often by looking at solutions others have come up with. "Monkey see - monkey do" is pretty much part of the engineering process. While at University we wrote a top-scoring piece on how Apple scooped Creative in making a portable digital hard drive backed music player with great design and even greater marketing. When doing a tear down for inspiration and copying ideas always be wary of patents. I am planning to move my ATM90E26 + Wireless Stack Energy monitor into a more industrial DIN rail format. To get an idea about how things are packaged inside a DIN rail energy monitor I ordered a no-patents cheap energy monitor with pulse output from AliExpress. 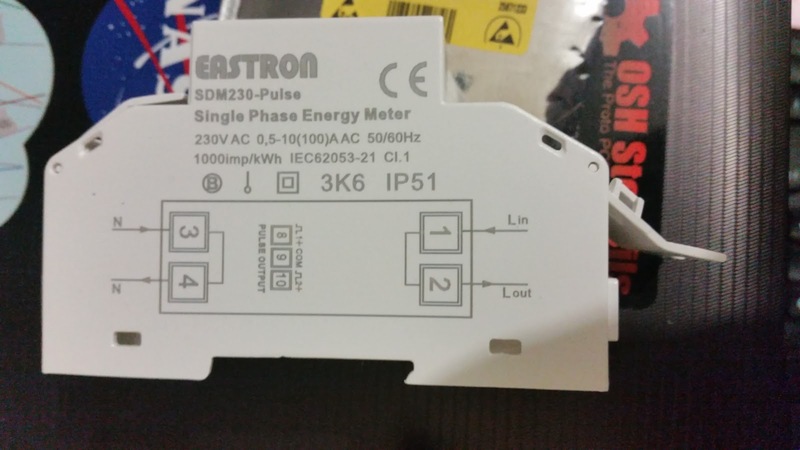 The brand is Eastron, they also make quite affordable 3-phase versions which I am going to look at next. Once the meter arrived I did not even plug it in (in Australia an electrician will be required to properly install it due to the cutting of the live line to place a shunt and other modifications). I put a screw driver through the QC sticker, popped open the clipped on enclosure and proceeded to have a peek inside. What I found was a house of PCB's stacked around a transformer to make best use of the place inside the enclosure. The following labelled photos show the various parts. The stacking places the main processor board with AFE + MCU and LCD display on top, the transformer and associated carrier and high voltage safety stuff (Varistor and PPTC) at the base. The base PCB also carries the Live/Neutral connectors and a bulky current shunt. One vertical PCB is the power supply, voltage and current waveform sampler and the other is an isolated pulse and modbus output board (Modbus chip is unpopulated in my pulse only version). The voltage sampler uses a resistor ladder of 4x270K resistors in series with a relatively small voltage sampling resistor. The PCB is not heavy on expensive board to board connectors, which allows a modular system and swapping of boards, instead it relies of solder fingers on board edge to link the boxy shape together. The same board also carries the power supply module derived from a regulated full wave rectified output from the transformer. 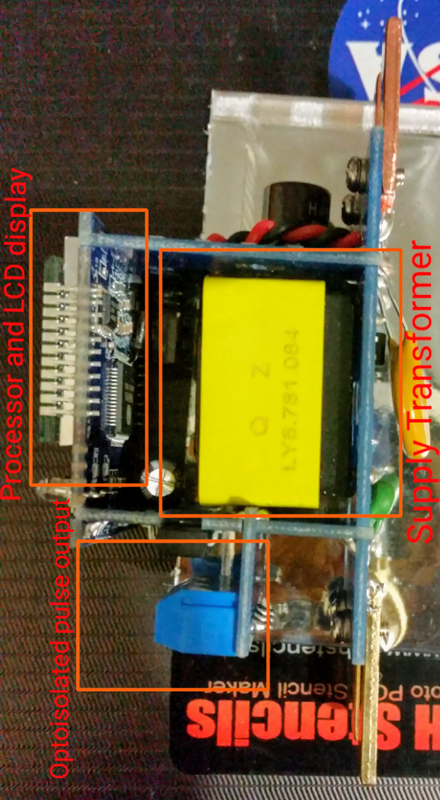 I am not sure if the transformer is isolating, it does not need to be since the isolation occurs at the end stage with a couple of optocouplers. 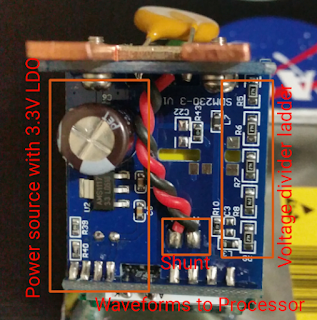 The voltage sampler and the current shunt are obviously non-isolated. 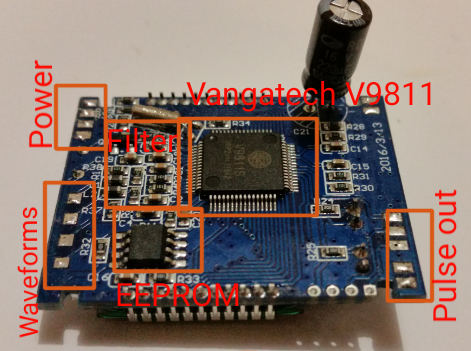 All the magic of actual energy monitoring then happens in the Vangotech V9811S with includes a 8052 MCU for driving the LCD and other functions such as Modbus support. 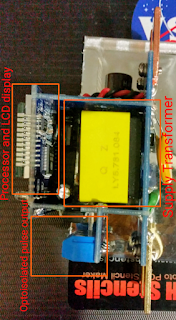 I am planning to power it up with a 3.3V/5V supply and feed it waveforms from my low voltage AC test rig and observe the readings. I also have 3 phase version from Eastron on order and a few engineering samples from Vangotech for their 3 phase ASIC to build a low cost/ low voltage Dev kit like I did with the ATM90E26 Featherwing.